Place the potatoes in a medium pot and add enough cold water to cover. Bring to a boil and add 2 teaspoons salt. Reduce heat and simmer until tender, 12 to 15 minutes. Drain, run under cold water to cool, and cut into quarters. In a bowl, whisk together the sour cream, lemon juice, ¾ teaspoon salt, and ¼ teaspoon pepper. Add the potatoes, celery, and chives. Toss to combine. Meanwhile, heat grill to medium-high. In a bowl, toss the asparagus with 1 tablespoon of the oil and ¼ teaspoon each salt and pepper. 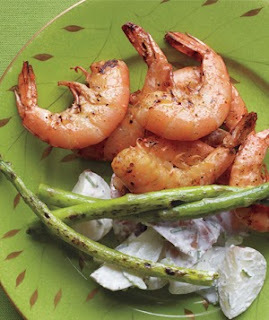 In a second bowl, toss the shrimp with the seafood seasoning and the remaining tablespoon of oil. Grill the asparagus, turning occasionally, until tender, 6 to 8 minutes. Grill the shrimp until opaque throughout, 1 to 2 minutes per side. Serve with the asparagus and the potato salad.